Between sun and rain, today I did a good ride of 1h30 betweem home and near beachs. The firmware was built with SDCC 3.7.0. Will you be making this latest version be available on github sometime? I just wondered if it may have any effect on the (windows users) compiling issue? The version I am using is on master branch of github. I just updated the compiler version to 3.7.0 and I found that the compiled firmware was about 40% smaller but still works the same. The issue is thay the SDCC developers didn't put online a Windows version for 3.7.0 unlike on version 3.6.0. On Linux, I had to compile/build the version 3.7.0 but it is a regular way of doing it, we are used already to compile some of the software, mainly when we want the latest versions. Please search on Google, maybe some one already compiled SDCC 3.7.0 and is sharing the executables. Ah - ok, my lack of developer knowledge showing here, I was forgetting that the firmware has to be built into executable (in windows or linux) in the final stage..
i am pretty sure i have almost all required software installed on my PC so will give this a try tonight. My plan is to first take some good pictures; try to measure PWM frequency looking at motor phases; understand how torque sensor and how we can read it; understand how we can connect wires or such on the board knowing that it is potted. Some manual path settings are necessary also, but this could be done automatically in the Start_compiling.bat. Compiling of the recent master branch works with this. Last edited by stancecoke on Apr 09 2018 5:33am, edited 1 time in total. Finally, I've managed do figure out which files of cygwin are necessary to run the windows release of 3.7.0. Some manual path settings are necessary also, this could be done automatically in the Start_compiling.bat, I think. So, If I can understand correctly, with SDCC 3.7.0, on Windows and Linux, the master branch compiles correctly, no more that 2 issues!! And also with added improving on firmware code size. Good work Stancecoke. Would be great if you can write the instructions. SDCC is GPL license. Our project uses the same kind of license and is on the same philosophy, I am pretty sure is ok for us to share the executable. Also our project is a good example/reference of using such tools. no more that 2 issues!! The issue with the #defines is still the same. Right now I am "bitbang" current/torque instead of doing a PI controller and I hope it is ok. At least it is very fast as David mention that it should be. Why all this work? because I like to also have speed controller working (very well). I hope that implementing speed controller like this way, the PI controller coefficients will be quicker and easy to adjust by the final user. I think is kind of magic when I feel the machine answering fast and precise to my desires. I mean, when using the torque sensor and I feel that I have refined as also fast control of the machine/bicycle. Hmm, I don't now, why we need a speed control, the only thing we need is a smooth reduction of motor power at the speed limit. With a direct drive motor, yes, with the power reduction there will be a wall that is the wind + motor regen. 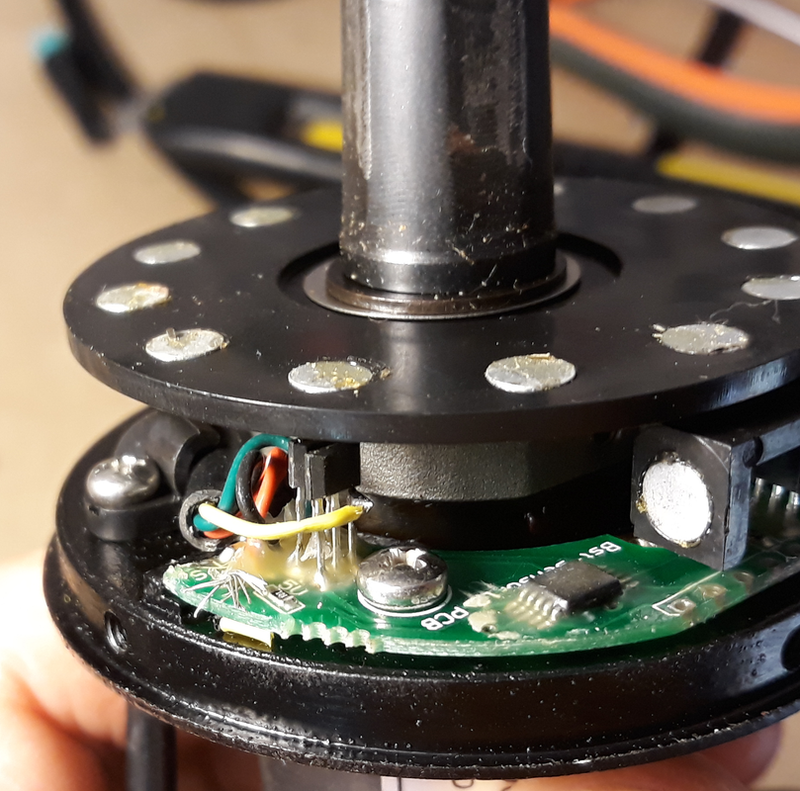 With a geared motor, yes, with the power reduction there will be a wall that is the wind only and unlike direct drive motor, the motor stops and will disengage from the wheel. And on current firmware, speed control is optional. I updated the uart.h file and it builds ok with SDCC 3.7.0. To control the speed, we would increase (positive) motor torque when speed is lower or decrease (put negative torque for braking) motor torque when speed is higher. On our ebike application, maybe we should not apply negative torque/brake! On a downhill for instance, after passing the speed limit value, we do not brake the motor. On a geared motor, motor will desingage and will not make resistance/brake. On a direct drive motor, the duty-cycle will increase in a way to keep regen/brake current == zero and so tje motor should also not make resistance/brake. The only thing braking the rider will be wind or inclination. That's great. And I updated the ones on initial site, using your text. I don't know howto solve that issue of the #defines. I have not updated the description of the Java-Tool in the help sites yet. Last edited by stancecoke on Apr 11 2018 4:50am, edited 3 times in total. statement in the config.h for Linux users. I would like to research more, at this issue is not supposed. Maybe I will ask for help on SDCC mailing list. It's a fast workaround. The recent code doesn't work in Throttle/PAS mode for windows users. Please play with the following change, and try different values for #define EBIKE_THROTTLE_TYPE 0, like 0, 1, 2 or 3. Maybe try to use instead #if (EBIKE_THROTTLE_TYPE == 1) and #if (EBIKE_THROTTLE_TYPE == 2) instead of EBIKE_THROTTLE_TYPE_THROTTLE_PAS and EBIKE_THROTTLE_TYPE_TORQUE_SENSOR. If you enable regen, the settings of PAS/THROTTLE and TORQUESENSOR in the config.h are overwritten in the main.h. So you can set Throttle/PAS only, if regen is not activated. So you can't combine Throttle/PAS with regen at the moment. Ok!! Good to know that is working as expected. So right now there is no issue!! You mean enable regen like coast brakes. Yes, as I told before, I implemented that feature for me, to use with torque sensor. By the way, I just received more torque sensors to repair the broken one. Also some LCD3 and so I can look at power used while riding, unlike on LCD5 that I has on my ebikes. I found that at least on S06S, each ADC 8 bits step equals to 0.35 amps (35*0.35 = 12.25 amps). The LCD5, each current step equals to 0.25 amps, so I multiply the current ADC 8 bits step value * 1.5 and the LCD shows to me a very near wattage value. Are you aware that you will have to use torque sensor and modding it with a PAS to get that feature you like?? Done!! tested and works as expected. This mod is much more easy and clean - thanks. Yes, I hope the adaptation of the code will be fast, maybe I can do if over the weekend. This mod doesn't work because the output signal from the sensor is always the same: ui16_pas_on_time_counter > ui16_pas_off_time_counter for both directions, so, there is not way to detect rotation direction. This is probably why they have added hardware/cost.